Yes, Joe would be “the Badger and Fox Sage”. Slight difference. I’m gonna have to pay Mitsui for a whole new set of avatars when we do the Korrektiv 2.0 redesign. This might need a little more explanation, at least for those who don’t follow every blessed comment. The title originally belongs to the great Shusaku Endo, at least where NesCafe Gold circa 1972 is concerned; Matthew said he liked the title; I decided to find out exactly what they, the Japanese Mad Men, meant by it, and did a little research. 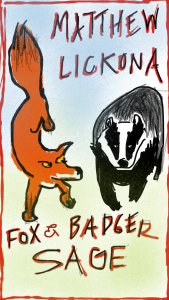 I skimmed the first and learned, as you might guess without reading anything, that the the fox and badger were something like fairies, trickster spirits really, with a long history in Japanese folklore. The Fox and Badger Sage was someone who somehow tamed these spirits and used them to his advantage … one story tells of an old man who kept them in a kind of pipe (not the smoking kind, although that’s a nice image as well) and released them whenever he needed them to work their magic. Another story has them kept in the sage’s pocket, whispering to him whatever he might need to know, and giving him the power to see clearly into both the past and future. This certainly applies to Endo for Silence, the Samurai, Kikiu’s Story and all the others. But I think it applies to the author of Alphonse and Surfing with Mel. If Matthew doesn’t like it, I’m happy to take the title for myself. Oh I like it plenty. I’m just pretty sure that I don’t deserve it. You take it. I’ll go with the Sloth and Crow. Great work on the image. Wow, somebody around here besides me reading Philip Roth. My day has been made!